In April 2003, just after Mike Weir had become the first Canadian man to win one of golf’s major championships, a colleague asked me if Weir’s win was the greatest moment in the history of Canadian golf. I replied, “It depends if he wins another major or not.” My reasoning being that, if Weir’s Masters was a one-off, he’d just become of the 106 other guys who’ve fluked out one major (can you say Steve Jones?). But, if Weir went on to win more majors, that makes him an elite player – and that first Masters much more significant. After the first round of the U.S. Open at Pebble Beach, Weir sits one shot back of the leaders. Question is, will this be Weir’s second major breakthrough? When Mike Weir won that 2003 Masters, he did it in fine style. He sunk a knee-knocking putt on 18, just to get into a playoff with Len Mattiace. Then, on the 10th hole, Weir won the green jacket when Mattiace ended up being stymied behind a greenside tree. Sports Illustrated made Weir their cover boy, with the headline “A Star is Born.” Weir won his first PGA TOUR event in Vancouver four years before that Masters, so his weekend at Augusta was the culmination of something most golf fans hoped was coming. But, as the years have rolled by, a star was not born. Weir won twice more on the PGA TOUR – 2004 in Los Angeles and in 2007 in Phoenix at the Fry’s Electronics Open. But, what could have been a second career-defining moment for Weir, at the 2004 Bell Canadian Open, wasn’t. That Sunday afternoon, at Glen Abbey, Weir went into a playoff with Vijay Singh. The entire country was on pins and needles as Weir looked ready to become the first Canadian to win our national championship since Pat Fletcher in 1954. But Weir lost that playoff and, as they shook hands, Singh whispered, “I’m sorry, Mike.” Singh knew how big the moment was. And Mike Weir has never been the same since. Weir’s other significant post-Masters collapse came at the 2006 PGA Championship at Medinah. Through 54 holes, Weir sat in third, just two shots behind co-leaders Tiger Woods and Luke Donald. But Weir shot 73 and finished in sixth. Clearly, if Weir is to win a U.S. Open at Pebble Beach, he’ll have to exorcise a few demons. 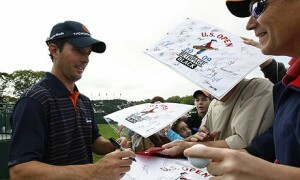 In his 12-year U.S. Open career, Weir has four top-ten finishes. So he likes the event. But he only hit half his fairways today and carded six birdies and five bogeys. Players who scramble to not usually win the United States Open. It’s gotta be tough to carry the hopes of an entire country on your shoulders. But that’s what happens when you win The Masters. Mike Weir turned 40 years old last month. We want to see you do it again, Mike. We see the odds are against you. But all Canadians want to witness you become the player we thought you might be that Sunday at Augusta. Sad to say but Mike will make the cut and then fade away on the weekend like he usually does. On one hand I feel sorry for Weir as he carries the hopes of a nation on his back every time he tees it up, but on the other, I find him incredibly frustrating as he continually shoots himself in the foot. Despite his prodigious work ethic and talent, he is wound extremely tight and lets that 6 inches between his ears affect his play. How many times has he started low, only to falter on the weekend? His best performances are when he comes from behind, when the pressure is off. His Masters win was a sunday 68 following a saturday 75. Mike’s weekend scoring average is almost two full strokes more than thusday/friday. (72.25 – 70.44) His sat. average (72.33) ranks him 173rd on tour, and this has been a trend for many years. Sorry folks, but that just doesn’t cut it. And Weir’s biggest problem? He won a major. Suddenly, everyone looks at you as a different player. And maybe you’re just simply not that different. You just happened to win a big one. I cheer for Mike, too. Primarily because he’s Canada’s best hope. Golf is a ridiculous sport anyway, who cares? OK, OK, OK. We need to talk about the green jacket. That HIDEOUS, OLD MAN, GREEN JACKET. It’s a curse. Once you’ve won the Masters, bad things happen to you. BAD BAD things. Look at Tiger! He’s a mess. And HOW MANY GREEN JACKETS DOES HE HAVE HANGING IN HIS CLOSET? I nominate a blue jacket.